A very small and rare species of shark is swimming its way through scientific literature. But don't worry, the chances of this inches-long vertebrate biting through your swimsuit is extremely slim, because if you ever spotted one you'd be the third person to ever do so. This species common name is the "pocket shark," though those in the field of classifying animals refer to it by its scientific name Mollisquama sp., according to a new study published in the international journal of taxonomy Zootaxa. While it is small enough to, yes, fit in your pocket, it's dubbed "pocket" because of the distinctive orifice behind its pectoral fin--one of many physiological features scientists hope to better understand. 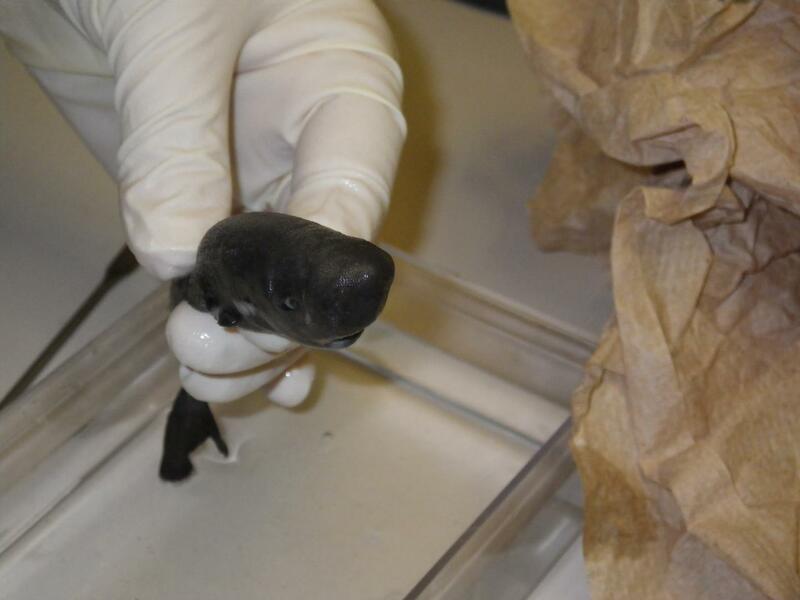 "The pocket shark we found was only 5 and a half inches long, and was a recently born male," said Mark Grace of NOAA Fisheries' Pascagoula, Miss., Laboratory, lead author of the new study, who noted the shark displayed an unhealed umbilical scar. "Discovering him has us thinking about where mom and dad may be, and how they got to the Gulf. The only other known specimen was found very far away, off Peru, 36 years ago." Interestingly, the specimen Grace discovered wasn't found it the ocean, per se; rather in the holdings of NOAA's lab in Pascagoula. It was collected in the deep sea about 190 miles offshore Louisiana during a 2010 mission by the NOAA Ship Pisces to study sperm whale feeding. Grace, who was part of that mission after the rare shark was collected, and upon uncovering the sample at the lab years later, recruited Tulane University researchers Michael Doosey and Henry Bart, and NOAA Ocean Service genetics expert Gavin Naylor, to give the specimen an up-close examination. A tissue sample was collected, and by tapping into the robust specimen collection of Tulane University's Biodiversity Research Institute, scientists were able to place the specimen into the genus Mollisquama. Further genetic analysis from Naylor indicate that pocket sharks are closely related to the kitefin and cookie cutter species, fellow members of the shark family Dalatiidae. Like other Dalatiidae shark species it is possible that pocket sharks when hungry may remove an oval plug of flesh from their prey (various marine mammals, large fishes and squid). The specimen is part of the Royal D. Suttkus Fish Collection at Tulane University's Biodiversity Research Institute in Belle Chasse, La., and it is hoped that further study of the specimen will lead to many new discoveries. Already, the specimen--when compared to the 1979 specimen taxonomic description--is found to have a series of glands along the abdomen not previously noted. Partners at the Smithsonian Natural Museum of Natural History in Washington, D.C., and American Natural History Museum in New York City have also contributed to the study of this shark. "This record of such an unusual and extremely rare fish is exciting, but its also an important reminder that we still have much to learn about the species that inhabit our oceans," Grace added.